Time to Get Your Gala On! 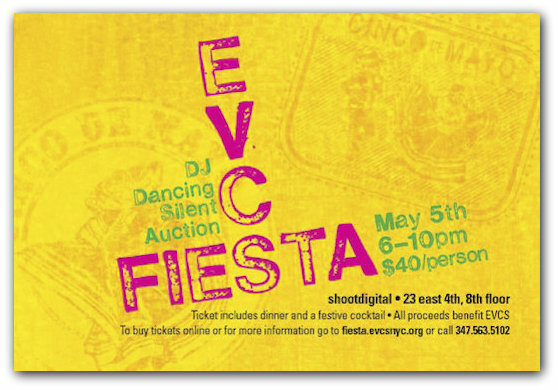 Book those sitters for Saturday May 4, and come eat, drink, and be merry with the EVCS crowd. Your invitation is in the mail (thank you K-dad, John! ), but in case you just can’t wait another second to purchase your Fiesta tickets, you can do so immediately right here. Like to lend a hand to make this an even more successful event? We can use help in advance of the event (organize a raffle? Sell tickets in the yard?) and during (bartend for an hour!). Volunteer now! Or email volunteer coordinator Julie Endich (please put VOLUNTEER in the subject line). Silent auction donations are rolling in (eco-lodge stay in Nicaragua, anyone? ), but your ideas and your powers of persuasion are still most welcome. See you May 4! Ole! Our big spring Gala will take place on Saturday, May 4, from 6pm to 11pm. There will be a live Flamenco Trio, dancing, DJ, Raffles, and a silent auction. Appetizers and cocktails begin at 6:00, followed by dinner and desert. shootdigital, 23 East Fourth Street, 8th Floor. It promises to be a festive and memorable event. We hope you can share in the fun in helping us raise money for our kids. You are more than welcome to invite friends and family to join you at this event. Even if you are unable to attend, please consider making a donation at one of the support levels listed above. All proceeds go to the EVCS Parent Association, to make sure that programs including guest speakers, music, and drama will continue to be available for EVCS students. I’m about to ask for your help, and for your money. But before I do, I want to update you on the phenomenal success of our PA fundraising efforts to date, and to loudly and clearly thank you! We are on budget, and on target for reaching our year-end goals. As always, your generosity and engagement are what make this all possible. Thank you! Thank you! Thank you! The Spring Gala needs hands! Can we borrow yours? You can help with decor, set up, clean up, food, sound, lights and more. To volunteer, please go to www.signupgenius.com/go/8050F4FAEA92EA31-evcs and select a task. Julie Endich will contact you once you’ve signed up. The Gala silent auction is the centerpiece of the event (with the exception of Bradley’s pole dance, which – rest assured – is on!). It typically raises around $10,000, or roughly 20 percent of the total PA budget … a fair chunk. To achieve this, we need your help soliciting items of value. And, not to be crass, but the higher the value, the better. As Kevin Bacon taught us, you are probably no more than six degrees away from some universally adored person, place or thing that could be a hot ticket in the auction. Identify who or what that might be and then, if you feel comfortable asking, go for it! Even better — are you a universally adored person, place or thing? Can you donate an item or service of value? We especially love auction items that come directly from the hands and hearts of our own community members. Would you employ your proven charm and obvious beauty to make a cold solicitation from a corporation or major established business? Many have entire departments set up to deal with these kinds of requests. The Man is literally waiting for your call! Extraordinary Experiences A walk-on in a Broadway show! Barefoot grape stomping in Napa! Survivalist boot camp! A sail on New York Harbor, or any harbor! Kid Focused Birthday-party packages! A week or two of Lego camp! Sleepover party at a museum! A visit from a magician just for you! Family Friendly Tour of the White House! Yankees tickets (yeah!)! Mets tickets (boo!)! Tickets to Cirque du Soleil! Beauty and Fashion Outrageously priced age-defying face cream! Finely tailored designer togs! Those shoes! Yes, those ones…! Food/Wine Romantic dinner for two! Bottomless ice cream cone! Wine-bar gift certificate! A CSA membership! Services Life coaching sessions! Financial planning! House cleaning! Babysitting gift certificates! Please see attached letter and donor form, which provide you with all the info you need. If you have questions, email me at events@evcsnyc.org with AUCTION QUESTION in the subject line. With your friends, your talent, and your willingness to ask total strangers for freebies, the Gala will be a big success and our fundraising year will close out with wins across the board. If you can help get items/services/etc to be auctioned at our Gala in May — thank you! You should download this letter and donor form; the letter helps explain what you are doing and why; the donor form should be filled out by the donor or solicitor (that’s you) and returned with the item being donated (when applicable) to Moira Brennan, or email to events@evcsnyc.org. Thank you to everyone who came out to Saturday’s EVCS ¡Fiesta de Cinco de Mayo! We raised over $13,000 for our children’s enrichment programs and we had a heck of a good time doing it! We hope to see you tonight at the best EVCS party of the year — ¡Fiesta! If you haven’t already purchased tickets, you will be able to at the door with cash, check (“EVCS Parent Association”), or credit card. Your first drink is on the house, after which you can purchase additional drink tickets for $5 each or five for $20. No doubt about it, this event is a fundraiser so that the PA can continue to pay for important enrichment programs like music, drama, and Spanish. But our goal is also to throw a great party and get to know each other better as, you know, adults. So if the suggested ticket price is a hardship and is keeping you from joining the party — please just come anyway. Send an email to events@evcsnyc.org so that we can put you on the list and have an accurate head-count. Everyone from EVCS is welcome. It’s not all fun and games, not all fancy bikes and bags — this Saturday’s EVCS ¡Fiesta! is also a lot of work. But like most big jobs, the more people who help, the lighter the load. Please volunteer a little extra time on Saturday to help us make this event a success. If you have any questions, or would like to help in some other way, send us a note at events@evcsnyc.org.